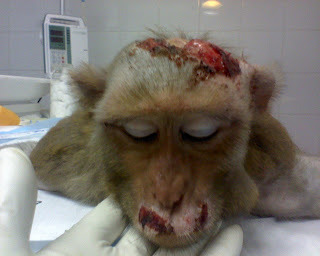 In solidarity with World Laboratory Animal Liberation Week (April 16th – 24th, 2011), Smash HLS will protest outside Primate Products. In late August 2010, haunting photographs were leaked to the public by the Animal Liberation Investigation Unit. Dedicated and caring individuals pledge to continue to protest the barbarity of this company. Donald Bradford and all the other degenerate employees are responsible for the horrific torture and murder of defenseless primates. We will forever remind them of their shame.